HAMBURG, Germany, March 13 (Xinhua) -- More than 40 pairs of running shoes, five oranges, boxes of peanut brittle and his legs. 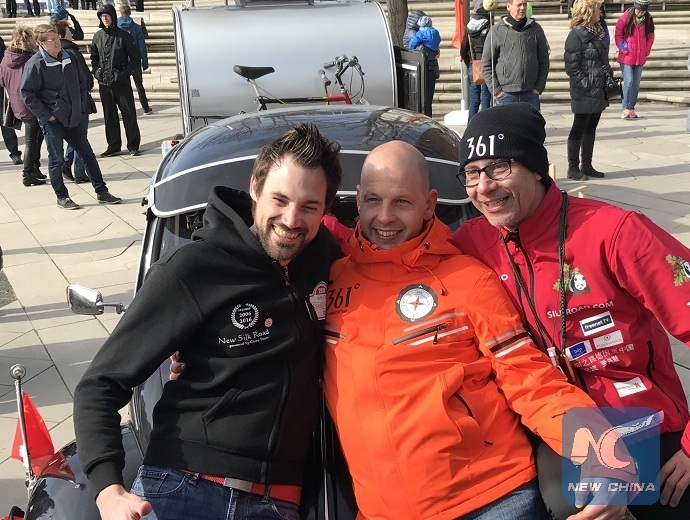 Kai Markus Xiong from Germany did not bring much when he began his super marathon on Sunday, which started from Hamburg's landmark concert hall by the Elbe river, Elbphilharmonie, to Shanghai, on foot. Even Xiong himself considered his adventure "a bit crazy". In about eight months, the running maniac will go along the historic Silk Road, for approximately 12, 000 kilometers, with an estimate of 18.5 million steps. According to Xiong's ambitious plan, he will "run, hike, walk, or crawl" 50 to 70 kilometers per day, and reach his destination in November. Along with him, his best friend, experienced adventurer Victor Neubauer, will transport most of the equipment and food in a VolksWagen beetle hauling a caravan. They will rest and get supply in cities or villages en route, but if they are exhausted in the middle of nowhere, they probably have to huddle together for warm and sleep in the caravan, Xiong said. "The most difficult on the way is I cannot support my families, and my friends. When something happened, it will be really really difficult for me to do anything," added Xiong who married a Chinese wife and have a child. The ancient trade route, linking east and west, witnessed merchants and explorers, but never a jogger before. "The main goal is to bridge the cultural gaps and dismantle prejudices between Germans and Chinese," Xiong said, adding his long journey will be covered by "Nihao Deutschland", a TV program presenting China to the German audiences. Xiong said most of the Germans heard about the development of Chinese economy on TV, but they probably don't know that China has made conspicuous progress in various fields for the past decades. The 44-year-old Bavarian is also a Chinese culture lover. At 12:15 p.m. local time (1115 GMT) on Sunday, Xiong blew his whistle and started running, wearing a full-zip-hoodie, on the back of which writes "Journey of a thousand miles starts with a single step."